-mirage vol 1, 2, image tmnt comics meaning vol 3 comics, and especially vol 4 and the tales of the tmnt vol 2 era!!! -thoughts about, impact of and making off of turtles 2 and turtles 3 ( I mean the live action movies by that)...love to hear from the teams of the third movie about the enormous and well researched feudal japan environment and the shoot in oregon. -I honestly would be curious to see a making off or in depth conversation with the makers of the next mutation tv series.what were their goals, why they chose this approach exactly etc...especially interviews with the hong kong stunt team from raymond chow if I don't err here was involved, right?to hear from them would be awesome! you had a little of this in the first volume of the doc series, this would be so precious to me!I LOVE the moment when we get to see jim ink a turtle! -a close up of every turtles toys (I am talking the basic figures and vehicles here) packaging art work from the vintage line! would be interested to hear their stories too in their own words of course. okay, I think thats all for the moment.will write again if I can think of something I forgot. thanks for sticking to the project and fighting for a second part! !you rock! Last edited by marcelangelo; 04-01-2016 at 03:20 PM. Turtles Forever was pretty much forgotten/unheard of outside of the core fanbase. A somewhat mature, feature-length adaptation of Mirage 1 probably would have made a bigger splash, and possibly lead to more. Look at the DC animated universe. I'm not saying it would have been that big, but the possibility was definitely there to have more similar works. If you really wanna wax tin foil hat possibilities, a moderately successful mature animated movie could have swayed Nick execs on what ultimately became the Platinum Dunes movie. Absolutely, that would be just as compelling as the "Superman Lives" documentary, about just that. It changed shape so many times... first it's the Kirby Movie, then it was morphing into something that included Venus from NT:TNM, Julie Strain was going to be an alternate dimension Enchantress... all of this long before the Imagi movie. Yeah, the Supes Lives doc was fun. I've been mildly obsessed with the film since the mid-90s, when word started getting out. I wish the doc hadn't been so sloppy, but it was a fun look behind the curtain. It took so long to finish that most of the material had already found it's way online, but the interviews were great. I REALLLLLY wish Cage would have participated. Unfortunately, all versions of TMNT 4 sounded god-awful. Gonna have to disagree with you there. I'm not saying all of the scripts were Citizen Kane (or even TMNT 90), but some of what was being developed was pretty cool. Some. Definitely not all. There was some steaming crap, too. The Hallmark mini-series would also be pretty neat to see discussed in detail on the new doc. Lets finally see that Splinter test footage and Shredder maquette that Laird mentioned! Last edited by d_osborn; 04-01-2016 at 03:39 PM. I tried to watch Turtles Forever and couldn't make it more than 15 minutes. It's very difficult for me to ever watch the 4Kids TMNT, even in something like that. But that particular evening, copious amounts of vodka shared with Plastroncafe helped quite a bit. Any joy I get from watching Turtles Forever -- and there is quite a bit of it because I loved that damn movie -- is quickly followed by an equal amount of cringing due to the hangover that followed. Cripes that was a lot of vodka. I don't have nearly the issues with Turtles Forever that a lot of people do. I thought each iteration was treated according to it's kind. From the surreal of the OT to the overly grizzled and grunty of the Mirage era stuff. For me any movie related details would be ideal. The movie 1 stuff was easily the best part of the documentary for me. Beyond excited for this. Turtle Power was the best TMNT movie in years ( ) and the only downside for me is that is was obviously truncated from what the filmmakers intended. I know a ton of work and research was put into content beyond the first movie, so I'm really glad that's not going to waste. The late-90s "dead" period, the comic revival(s), the unrealized comic/TV projects, and the lead-up to the 4Kids series are all things I'm very interested to see more about. Thanks for the update, and please keep us posted! Turtles Forever was pretty much forgotten/unheard of outside of the core fanbase. A somewhat mature, feature-length adaptation of Mirage 1 probably would have made a bigger splash, and possibly lead to more. Issue #1 of Mirage doesn't have enough content to last an hour and a half movie. It would be 45-50 minutes at best, and that's if they extended the fight scenes moreso than the panels seen in the comic. Its pretty obvious why they didn't do it. I think you should just simply touch on all the things the first part left out. I echo the other things that were said by the fellow dromers. We need to see 2K3 and Turtles Forever etc. Also, ME PERSONALLY, I desperately want more behind the scenes from TMNT 1990. I waited years to see all the secrets and unseen things in the first part and you guys weren't able to include it all, so PLEASE put it on the disc at least! Also, also, I have complained once via email and once on here that for those of us who donated to the project, we were promised to be thanked in the credits and this did not happen. When I complained, someone said they would be sending out discs... this also did not happen. So, if you make claims to your early supporters, you should follow through. Awesome news! Would LOVE some 2k3 stuff in Volume 2, particularly interviews with Lloyd Goldfine and any of the voice actors that are available. The OT cast interviews in the first volume were a lot of fun! Don't forget the $50 million John Woo movie from around 2001! Ah, yes. Specifically I'd love to see a segment interviewing Dan Berger and highlighting the old official website. Kind of a forgotten thing of the old days that I know a lot of people have nostalgia for. For sure have Dan talk about the letters he used to write as each of the turtles, he had a pretty fun ongoing story there for a little bit. Last edited by ToTheNines; 04-02-2016 at 03:52 PM. Yeah, beside the obvious of covering segments you were unable to or grazed over in the last (4kids, TMNT, Next Mutation, Image/Vol. 3, IDW, Nick, etc. ), more than anything, I want to see the stuff that didn't get made. There were like 6-7 turtle flicks that didn't come to fruition or were radically evolved from their original concept. Film-wise there's the first pitch with face-painted comedians, the 4th flick (with Julie Strain, Spyder, "the next mutation", cyber villains, etc. that one had at least 3-4 proposed iterations), the would-be John Woo movie, Steve Barron's 2000 Henson sequel, the Hallmark flick, the Imagi sequel, the John Fusco pre-buyout film, Blue Door, the list goes on & on. Next Mutation's second season was highly developed before being cancelled, Dooney's got a crap ton of concept art for it. & as far as animated series' go, we had two just prior to the 4kids cartoon, one being crude CGI & another hand-drawn (for WB). Another thing that would be interesting is global impact & international off-shoots. I would be so hyped if you could address the anime/manga, as well as the many toys, all produced in Japan, with wacky re-designs & Sentai/Ultraman aesthetics. Then you've got two different comic series' produced in Mexico & the UK respectively (with the latter also having magazines & newspaper strips, I believe), among other things. I'll also echo the "anything further to deal with the live action films" enthusiasm, especially regarding the first, though I'd love to see/hear more about the lesser covered sequels. Some "What-ifs" would be really cool too, similar to the un-produced movies. You know, get Ciro Nieli to describe his original pitch and/or have the team reveal other ideas they pursued prior to his being brought on, maybe some of the Mirage guys can talk about things that never got off the ground (I know Berger had a TMNT comic reboot in development at one point that got nixed due to the buyout), refresh us on those insane concepts Playmates had for the OT, how Next Mutation might have been different (such as how they at one point had Venus in pink, then made her cyan, then made Leo yellow so that there wouldn't be two blues, but ultimately put him back in the classic colors [I think Donnie was in black at one point, too! ]), that sort of thing. Video games! Turtles In Time is such a huge part of gaming culture. At the very least you've gotta show that, not to mention how infamous the first NES title has become. Oh, & I think a segment about crossovers would be supreme. Focus on Usagi/Stan Sakai, Savage Dragon/Erik Larsen (& by extension their partnership with Image & that series' creation), Flaming Carrot/Bob Burden, & Cerebus/Dave Sim (whose insight could be particularly interesting given he was the first to mesh with them). That's a perfect place to bring up inter-TMNT mash-ups like Turtles Forever, too. Anyways, mad hyped for this! Good luck! Any ETA? can you speculate what might be a possible time slot for the release of this new volume of the doc? maybe a ideal point of release around summer already when the new 'movie' (aka worst ******** with a turtle head on it) is coming or probably rather after that, around the time for the home release of that hollywood 'movie'? Maybe if you'll have me, I could do something for this one? I declined the original because I was in a dark place back then. I sent a possible contribution through PM as well. Film-wise there's the first pitch with face-painted comedians, the 4th flick (with Julie Strain, Spyder, "the next mutation", cyber villains, etc. that one had at least 3-4 proposed iterations), the would-be John Woo movie, Steve Barron's 2000 Henson sequel, the Hallmark flick, the Imagi sequel, the John Fusco pre-buyout film, Blue Door, the list goes on & on. The film series on it's own would make for a killer, super long documentary, like the 4+ hour long NIGHTMARE or GHOSTBUSTERS docs. It could easily be just as interesting of a showbiz industry doc as a franchise doc. An interesting look into independent film industry of the 90s, especially when centered around Eastman and Laird-- industry outsiders running a huge blockbuster franchise within the indie film biz. Warts and all. Something like how the SUPERMAN LIVES doc did a great job of showing the inner-workings of 90s blockuster franchise movie development. I honestly think it's just as interesting of a story as E&L starting the franchise, early Mirage days, etc. There are even more unseen/unknown versions that it would be great to see covered in-depth. The early Mouser version of the 1990 movie, the original environmental-based script for Secret of the Ooze with Casey Jones, I would LOVE to see the development of TMNT 3: THE SACRED SCROLL OF DEATH. I know E&L honestly tried hard to right the wrong of SOTO, to make something really, really cool. The TMNT 4 stuff was an animal all to itself. There's a lot of misinformation out there. The scripts weren't perfect, but the threads were there to make a very cool movie. It could have easily turned into the second best TMNT movie, obviously behind Barron's. Powder, you mentioned the Hallmark mini-series and the Barron sequel. Were they not the same project? I know that a few screenwriters that worked on the Kirby version wrote the Hallmark scripts. The story had something to do with the TMNT's individual spirits merging on the astral plane. I would LOVE to see Barron discussing his ideas on it. The Fusco project would be REALLY cool to see covered, too. Last edited by d_osborn; 04-03-2016 at 01:40 AM. It was my understanding that there were two concepts involving Barron, one being the Kirby thing where the turtles develop human-like traits, & another being a more direct sequel to the original film. But as you said, there's a lot of mixed up stuff out there, so I can't say for sure. Wow this is awesome news. Really looking forward to a second one. I would love to contribute. You guys were ok with it on the first one but since I live all the way in the Netherlands it was a bit difficult. 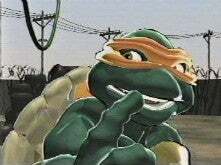 I do have a lot of TMNT material and if you are still including fans I hope I can contribute with my TMNT autograph collection and the contacts I have with the actors. Last edited by Raph; 04-03-2016 at 07:30 AM. Yes, it would be sweet to See all our photo contributions put into a feature on the new doc.